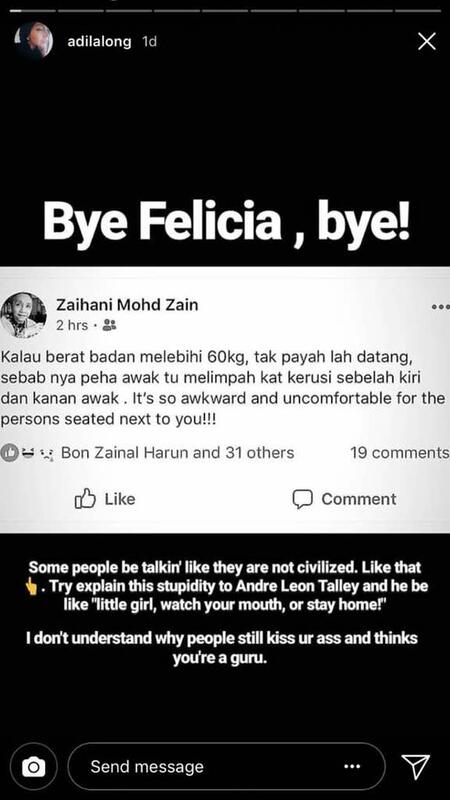 PETALING JAYA, April 17 — More Malaysian fashion designers have taken to social media to express their anger over style critic Zaihani Mohd Zain's fat-shaming post. Zaihani, known as Kak Zai in the fashion industry, said those who weigh above 60kg should not be attending fashion shows, prompting criticism from the public. Earlier today, designer Calvin Thoo responded on Facebook, saying that Zaihani had no right to stop plus-size individuals from attending runway shows. Sarawakian designer Datuk Tom Abang Saufi followed suit, uploading not one but two Instagram posts. Tom’s first post was a collage of influential fashion figures — who come in different shapes and sizes — such as former Vogue editor-at-large Andre Leon Talley and British fashion critic Suzy Menkes pictured with Vogue editor Anna Wintour. "Front row HEAVY WEIGHTS... fashion royalty...sizes and weight ..NO ISSUE..," posted Tom. In her second post, the Bornean designer shared pictures of her younger self and one with the Hermes brothers in Paris, France, depicting changes in her weight. “[I’ve] been many kilos different and done and attended many shows globally but never has weight been an issue,” captioned Tom in the post. Adila slammed Zaihani on Instagram story. Model Alicia Amin, known for her outspoken views about the fashion industry and women’s body image, said it was time to stop body shaming and called for more “socially conscious” fashion personalities. Zaihani, a celebrated fashion stylist and critic said sitting next to a plus-size person whose thighs were spilling over was “awkward and uncomfortable”.